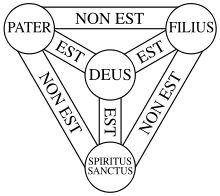 The doctrine of the Trinity (the Godhead is three-in-one, comprised of the Father, the Son, and the Holy Spirit) has been considered to be “orthodox” doctrine since about the 3rd century. Partially developed at the Council of Nicaea, it was later codified in a creed of uncertain origin, the Athanasian Creed. Despite the fact that the Athanasian Creed neither has a definite origin (although most agree that Athanasius did not write it), nor was mentioned by or sanctioned by any official council, its language has been used throughout the centuries as a “litmus test” for salvation and orthodoxy. Some would claim that this doctrine is clearly visible in Scripture, just not by name. Others would say that it is a doctrine derived from Scripture, but not clearly taught in Scripture. In this episode, Ray and Steve discuss the ramifications of this doctrine and its emphasis as a test of orthodoxy. Should a doctrine that is not even clearly preached by the apostles be considered a test of any sort? Must one understand and embrace this doctrine in order to be saved? You men should be commended for your honesty and bravery. You have raised valid questions that need to be addressed. They are that proverbial elephant in the room that everyone sees but acts as if it is not there. When one looks at the historical beginnings of the doctrine and political power struggles involved in its origins many questions come up. Keep up the good work and I hope you return to this issue in the future. Athanasius did not write the creed that claims his name, but he did write a wonderful book “On the Incarnation” that is worth reading…if nothing more than to clear his name. I am a new listener to the podcast and I love it!!! You guys are asking the same questions that I have been struggling with, God for sure lead me to this podcast! I am in a debate write now with a person who thinks I’m not saved because I question whether Jesus was actually God in the flesh and whether the trinity is true. It’s like if you don’t follow orthodox christianity, then you aren’t saved! Rubbish I say. Seek the truth and the truth will set you free. Keep up the great work, you guys are a blessing. I can’t wait to share your podcast with my wife! This brought back to my memory the time when a friend shared with me why she chooses Judaism over Christianity. She said, in essence, “Christianity has everything figured out, and leaves no room for mystery (about God).” I do believe that Jesus came to reveal what God is like, etc., but at the same time I’m desiring to cultivate a disposition within me that leaves plenty of room for mystery – not having all the answers to everything, because we don’t. Maybe with ‘big things,’ yes, but not everything. There IS, I’m seeing more and more, this thing about progressive revelation and seeing things through the lens of Jesus…. Judy! That is fantastic. My wife of almost forty years and I travel all over the Southeast doing roadshows. We are together 24/7 either traveling, at the motel, or at the show. We LOVE it. I enjoy her so much partly because of what I DO know about her. However, your comment made me realize just how much of a mystery she still is and the wonderment of continually discovering things anew. How exciting to know the known is the visible iceberg. The mystery is that massive unseen chunk below the surface. As I frantically seek to know God, I am beginning to realize the glory and excitement of the mystery. You’re so right. I don’t WANT to know it all. ( Some of my colleagues would read that with raised eyebrows!!). And, I have the rest of forever to bask in each revelation!